Ultimately I realized that I didn’t just like gin and tonics, but actually liked the taste of gin. (Boy did that make me feel like a grown up!) Since that fateful day about a year ago, I’ve taken the simple drink in different directions, depending on my mood, the weather and what’s in season. This particular version merges the bite of the gin and ginger with the tart sweetness of the cranberry and vodka for a twist on the classics that lets the ingredients shine. In a small saucepan, bring sugar, water, and ginger to a boil over medium-high heat. Once sugar has dissolved, turn heat down to a simmer (medium-low) for 2 minutes. Remove from heat and strain ginger slices. Combine half the strained cranberries (about ¼ cup), ¼ cup cranberry ginger syrup and lime wedges in a medium pitcher. Mash with wooden spoon until limes have released all their juices. Stir in gin, and let sit for 5 minutes. Add sparkling water and remaining syrup to taste. 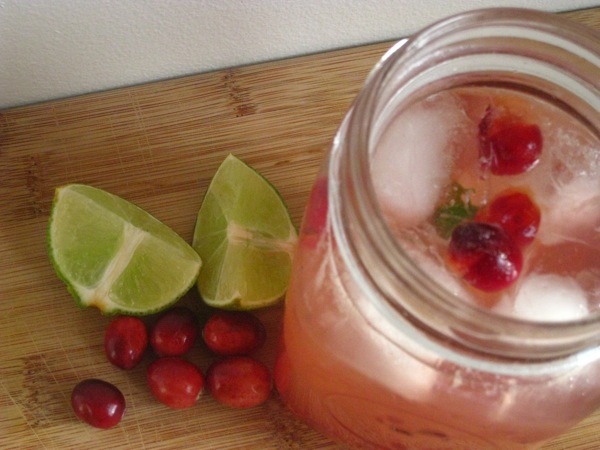 Pour in glasses over ice and garnish with remaining drained cranberries and lime wedge. I made this with Lounge Attire cocktail cranberries. They are ready to go, sweet but slightly tart. No boiling or sugar needed. Saves a lot of time and effort. And they are pretty in the drink. Their website is loungeattire.com.